Kylo Clustering is now available starting with version v0.8.1. Kylo uses jgroups, http://jgroups.org/index.html, for cluster configuration. This is chosen because Kylo’s metadata engine, Modeshape (http://modeshape.jboss.org/) uses jgroups internally for its cluster management. Make sure the file you referenced in the “configuration” parameter is in the /opt/kylo/kylo-services/conf folder. Refer to the sample files for setting up a jgroups configuration at /opt/kylo/setup/config/kylo-cluster . Note if working in Amazon AWS, refer to the “s3” jgroups configuration. Both modeshape and kylo jgroups files should use S3_PING, not TCPPING or MPING, to perform node discovery. We also have another jgroups configuration setup for Kylo nodes. We cannot use the ModeShape cluster configuration since that is internal to ModeShape. Download and extract the Quartz distribution to a machine. http://d2zwv9pap9ylyd.cloudfront.net/quartz-2.2.3-distribution.tar.gz You just need this to get the database scripts. 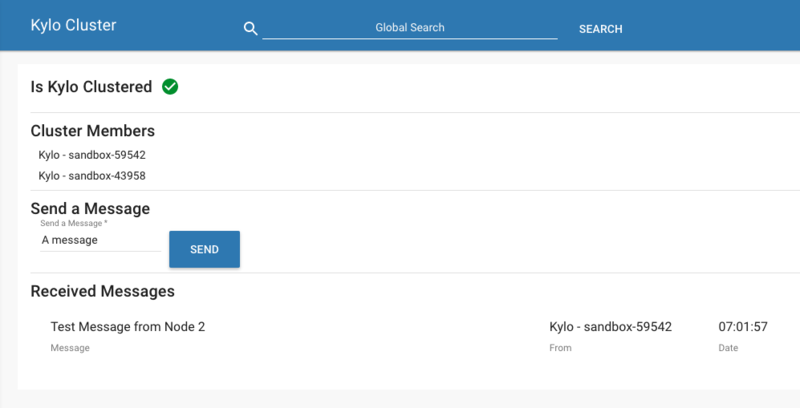 You can monitor the health of the kylo cluster by adding the kylo-service-monitor-kylo-cluster.jar to the /opt/kylo/kylo-services/plugins folder. Starting with Kylo 0.8.4 you can test your cluster configuration in the Kylo application. In a new web browser (i.e. Firefox), connect to another node in your cluster. Follow the steps above and connect to a different node/port. Send a message from one of the nodes. You should see the message appear in the other web browser. See screenshots below. The screenshots below are from a 2 node Kylo cluster. If this page correctly shows your cluster members, but fails to send the message or receive it follow the Troubleshooting tips below. Most likely cause of this is the system parameter -Dava.net.preferIPv4Stack=true needs to be configured. If the cluster is not configured correctly this page will indicate and provide you with information on troubleshooting. If you get a No subject alternative DNS name error, this could be because you are using periods in your S3 bucket name. To remedy, use a bucket without periods in the name. java.security.cert.CertificateException: No subject alternative DNS name matching my.kyloha.bucket.s3.amazonaws.com found. As a Sender you will get a prompt. Type in some string and then verify its received on the other node.